These numberless math word problems will help your students understand and solve multiplication and division story problems (single digit by single digit). Numberless word problems require students to process what the problem is and what is needed to solve it. Students will no longer absentmindedly compute the numbers they see, because there aren’t any numbers there – at first, anyway. This numberless math word problem resource will help your students successfully understand and solve single by single digit multiplication and division word problems. Introducing a word problem in a numberless fashion will help your students think about the problem situation without absentmindedly applying any operation that comes to mind. As the problem is processed, tidbits of essential information (numbers) are revealed until students are able to solve the problem. This strategy makes for a powerful number talk because it engages students in peer discussions as they explain their reasoning to one another. It also promotes flexible mathematical thinking because students learn to see relationships between information as they learn different structures of word problems. This resource includes EVERYTHING you need to implement numberless word problems with your students and even provides independent practice. 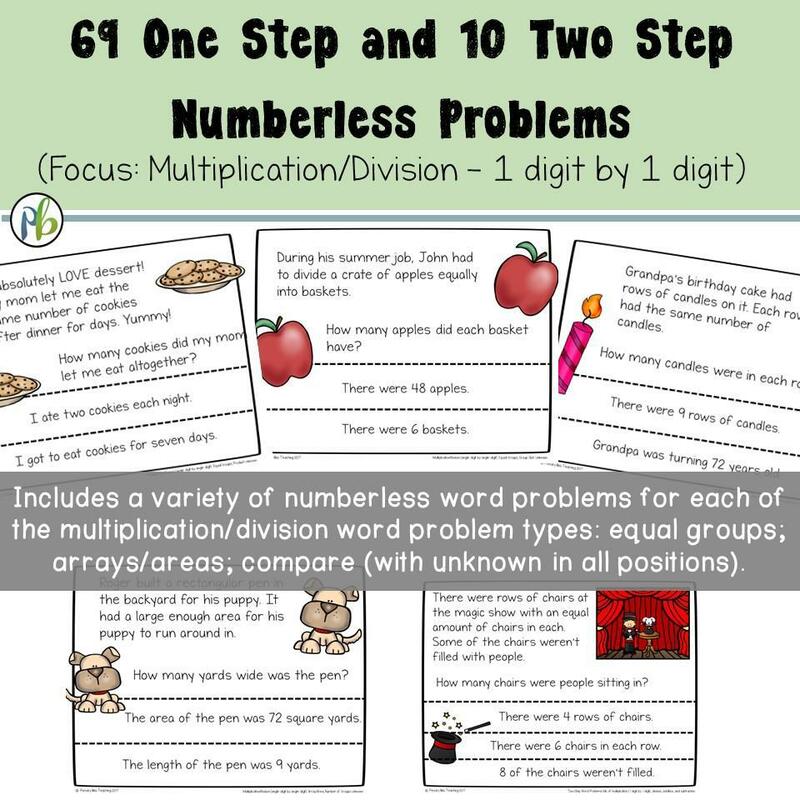 69 Single Step Numberless Multiplication/Division Math Word Problems: A set of numberless problems for each of the multiplication and division word problem types (equal groups, arrays/areas, compare) with the unknown in all positions. 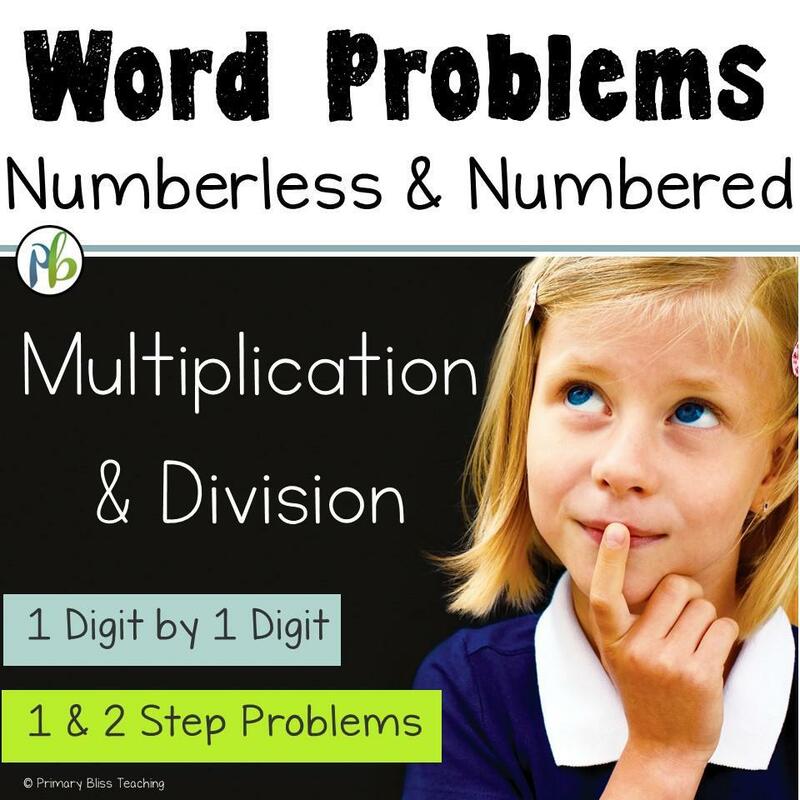 In addition, ten two-step word problems are included with a variety of multiplication, division, addition, and/or subtraction scenarios. 10 Two-Step Numberless Word Problems: These problems include multiplication, division, addition, and subtraction. 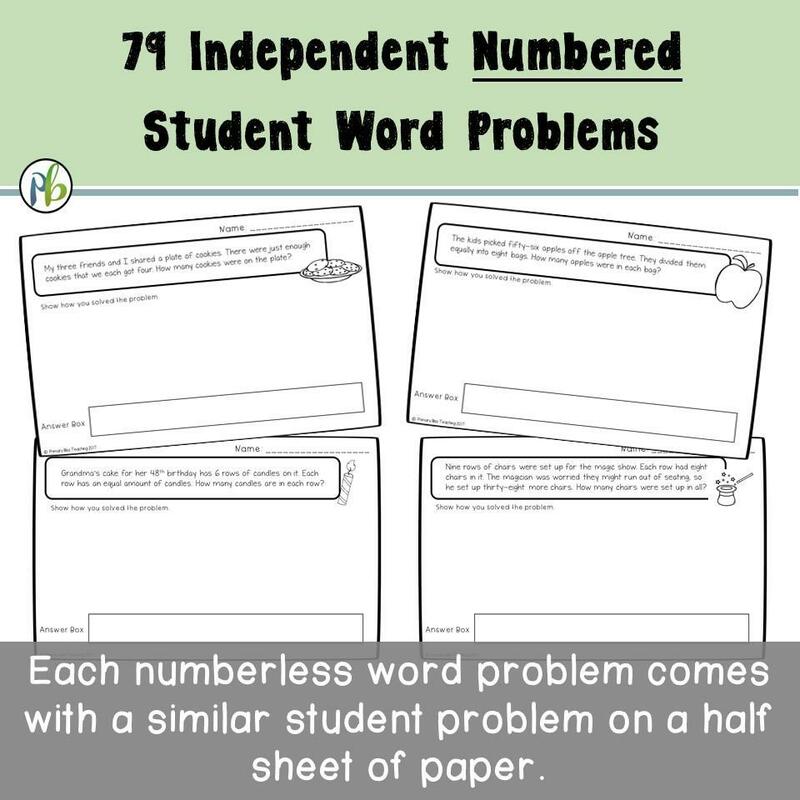 79 Independent practice pages: Each numberless problem comes with an “On My Own” problem that is similar in structure and topic but is a different word problem. They are on half sheets of paper to save paper. 9 Posters: These posters depict all of the multiplication/division problem types with the unknown in all positions (e.g. equal groups/product unknown; equal groups/group size unknown; equal groups/number of groups unknown). Lesson Quick Guide: This handy guide is a single sheet of paper with the steps listed for teaching a numberless word problem and question suggestions for each step. 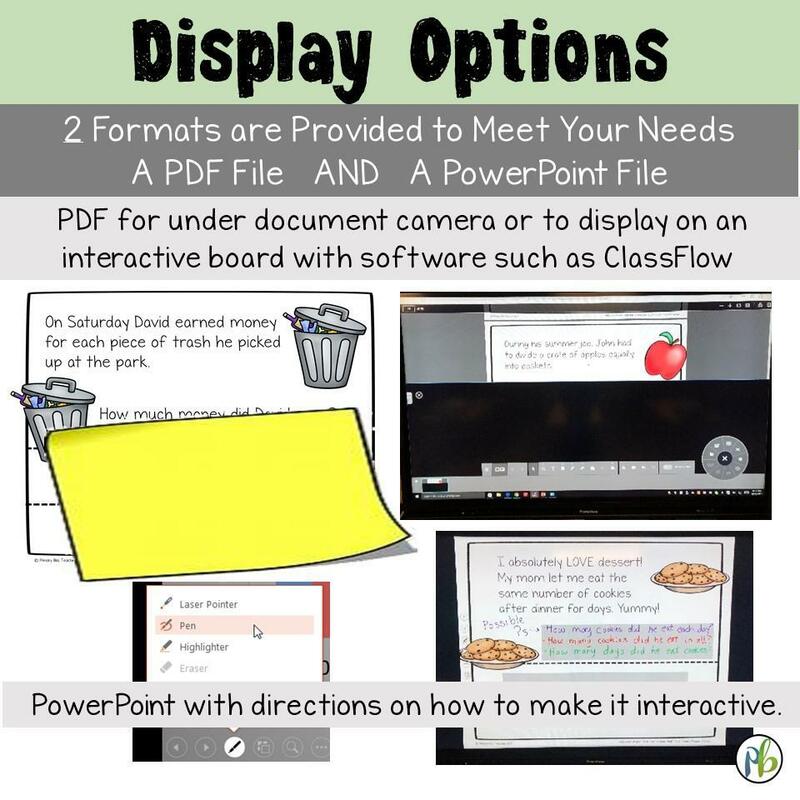 Two Format (Display) Options: A PDF file is provided to make a paper copy to display under a document camera. A PowerPoint file is provided to display on an interactive board using PowerPoint software with the pen tools. Wishing you joyful engagement in your primary classroom!